"CHARLOTTE, N.C. – For the second year in a row, Carowinds’ world-class ride, Fury 325, stings the hearts of coaster enthusiasts taking home the prestigious Golden Ticket Award for “#1 Steel Coaster in the World” over the weekend. Last year, Fury 325 was named “Best New Ride for 2015” during the ceremony, the first ever Golden Ticket award in the park’s history. The 19th Annual Golden Ticket Awards ceremony was held on Saturday at Carowinds’ sister park, Cedar Point, located in Sandusky, OH. These awards annually honor the “Best of the Best” in the amusement park industry and are calculated from an international poll of park enthusiasts, conducted by Amusement Today, a respected industry trade publication. Carowinds was also the only park in the world to have two of its coasters (Fury 325 at #1 and Intimidator™ at #8) ranked in the top 10 Best Steel Roller Coasters of 2016. In addition, Blackbeard’s Revenge, a new six-story waterslide complex that debuted this spring at Carolina Harbor Waterpark, placed second for Best New Waterpark Ride. Fury 325 has given more than 3.3 million rides since March 2015. It stands 325-feet tall and drops riders down an 81-degree plunge, reaching speeds up to 95 mph. 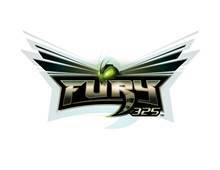 To see Fury 325 logos, photos and videos, click here. A complete list of all the Golden Ticket Award winners can be found at www.amusementtoday.com. Carowinds is owned and operated by Cedar Fair Entertainment Company, a publicly traded partnership that is listed for trading on The New York Stock Exchange under the symbol “FUN.” In addition to Carowinds, Cedar Fair owns and operates ten other amusement parks, two water parks, one indoor water park, and five hotels. Cedar Fair also operates the Gilroy Gardens Family Theme Park in California under a management contract."